Rewind to February 26th when we were at the 2016 Unite4: Humanity event. We look forward to this event every single year and, even more exciting, is that we are one of the proud sponsors of this special ceremony, alongside Variety! This year, 5 new faces were honored for their charitable work with organizations that are dedicated to making a difference: Olivia Wilde, Matthew McConaughey, Gina Rodriguez, and power couple Lauren Miller and Seth Rogan. Olivia Wilde was recognized for her work with Save the Children, which strives to transform children’s lives from the very beginning. Similarly, Matthew McConaughey was honored for his own foundation, Just Keep Livin, which he started with his wife Camila to empower high school students in need. Gina Rodriguez was awarded for her work with The We Will Foundation, a non-profit organization that provides financial support to those who need it most. Also, Lauren Miller and Seth Rogan were recognized for Hilarity for Charity, which aims to use comedy to raise awareness for Alzheimer’s disease. It was such an honor to see these celebrities celebrated for using their voices to change the world. But even more inspiring was one brave little boy who we awarded our 2016 Saint Vintage Love Cures Award. Dorian Murray (#DStrong) is known around the world for wanting to be famous and using his journey with childhood cancer to raise awareness for the disease! Dorian couldn’t be there in person during the event, so all of the celebrities signed a board in his honor – some even had the opportunity to Skype with Dorian! It is with a broken heart that we share the news that Dorian passed away a few days after the event. We are so glad that we had the opportunity to honor him and celebrate his life, showing him how much of an impact he made in the world! To learn more about Dorian’s story, you can follow his parent’s Facebook group dedicated to him. And to see more images from the Unite4: Humanity event, check out our album on Facebook! June is a very special month that is very dear to our hearts. June is National Cancer Survivor Month and Saint Vintage founder and jewelry designer, Paige Jansen-Nichols, is a 2x cancer survivor. It was her journey through battling cancer that inspired her brand and their mission – to give women beautiful accessories of hope that also give back to cancer research! In June, we want to celebrate life by celebrating the strong cancer warriors that have beaten cancer! Our team has handcrafted a beautiful lavender Love Links Bracelet that is unique to this special occasion – it’s our June Cancer Survivor Bracelet! Are you a cancer survivor? Wear this token of hope around your wrist. It is a symbol of hope, strength, perseverance, and love. When you put on this Love Links, let it serve as a token to remind you to live and love every day. If you do purchase a bracelet this month, we would love to see you wearing it! Just tag #SaintVintage in your SV Selfie post and share your story. To say thank you, we are giving away a 10% off discount code to our online store for your next purchase! Also, this Sunday, we have a special promotion running in honor of National Cancer Survivor’s Day. When you purchase a Cancer Survivor Bracelet on June 7th, you can get a second one for 50% off to give to another cancer survivor that you know! Just use code “SVaware” at checkout! But don’t wait – this code is valid for June 7th only! Wear awareness, share awareness, and let’s celebrate life! Where there is life, there is hope. As always, every purchase will donate 50% of proceeds back to cancer research so that we can support those who are still currently battling this terrible disease. To see more images and specials, make sure to follow us on Facebook! Fashion Bloggers in Saint Vintage! We are excited to announce that we have partnered with two very special fashion and lifestyle bloggers this month! They have each used our special accessories as inspiration for an outfit of the day. We are so grateful to have our jewelry worn by such empowering women! Now Introducing: Linen, Lace, & Love! Not one, but TWO loving sisters, Jen and Jess, who have dedicated themselves to finding and sharing everything from adventures to crafts to party ideas with you. Their first post was inspired by our Clover Double Tassel Necklace. Dressed up in a classic black tank and pants, Jen layered on an elegant pale pink blazer and our Swarovski crystal necklace! Trendy, professional, and sparkling for a great cause! 50% of proceeds from this giveback necklace are donated to cancer research to fund the cure for cancer. Their second post was inspired by our Art Deco Crystal Cuff – a design that was inspired by Saint Vintage Founder Paige Jansen-Nichols’ personal vintage collection. We love the white crop top and the bright blue pants that they chose to style with our bracelet! It’s the perfect summer look! We can’t wait to see what other adventures and trends they share! Now Introducing: Fashionably Lo! Lauren Price started this fashion and lifestyle blog to share her favorite must-haves with her followers. And we’re thankful for that! Her outfits are always beautiful. Lauren’s post was inspired by our Mary Anne Gumball Tassel Necklace. We read that she is obsessed with every possible shade of pink lipstick, so we were so excited that she chose our pink necklace to style! We hope so too! It’s impossible not to be inspired by Lauren’s outfit choices. To see more looks from these fashion bloggers (and more!) follow our Fashion Bloggers in Saint Vintage board on Pinterest! Come pin these looks to your favorite fashion board! 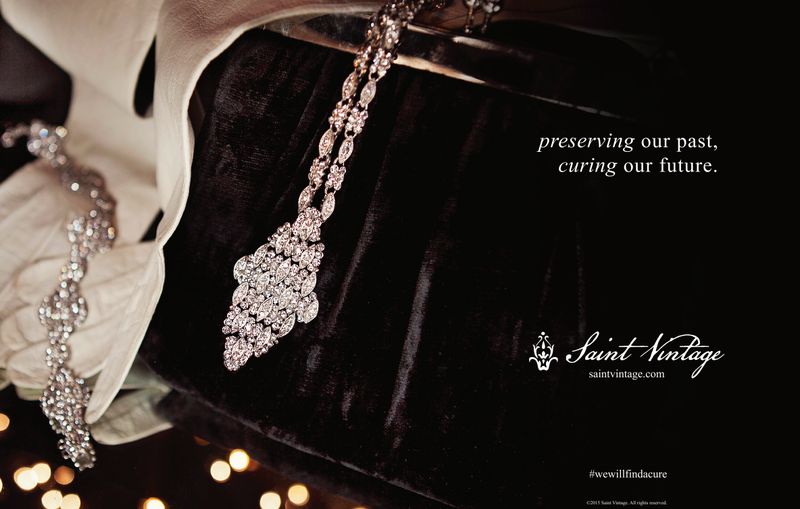 We take designing jewelry very seriously because every Saint Vintage accessory represents hope. Our eco-friendly luxury brand is inspired from vintage pieces of the past that we recreate to improve the future. Vintage embellishments, semi-precious stones, Swarovki crystals, vintage beads, and antique pearls are just a few of the elements that go into our accessories. And we have just taken our Couture for the Cure to the next level! We have recently introduced NEW jewelry into our online Couture Collection. Some are made from elegant clear crystal while other pieces are bold and colorful! Take a sneak peak at our new 2015 Couture Collection here first! You can also shop the jewelry by clicking on the image. You’re going to need a new cocktail ring to go with that new little black dress you just bought! Lucky for you, our cocktail rings are little black dress approved! They might not be bright, but check out the intricate design of crystals on each ring. Start experimenting with new up-dos because you’re going to want to show off these beauties! They may be small post earrings, but they pack a lot of sparkle! Get ready to get noticed. Each necklace is designed with a removable tassel – so it’s almost like you have two necklaces in one! We have a necklace for any style. Are you a crystal or mesh kind of girl? Whatever your favorite type of bracelet is – we’ve got it! Women buy our jewelry for two reasons: to feel beautiful while also supporting cancer research! We hope that whenever you look at our jewelry, you feel called to make a difference. We also hope that you remember to live every day to its fullest, because life is too short to take for granted. Shouldn’t your jewelry reflect your heart just as much as your style? So shop for a cause here! Starting on Sunday, March 15th, we are starting our St. Patrick’s Day Sale! Our Couture Celtic Bracelet and matching Celtic Earrings (originally priced at $130.50) will be available online for only $100! 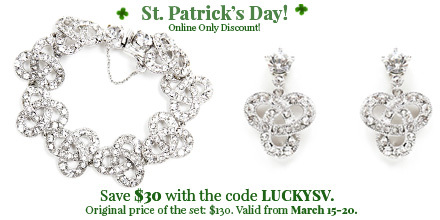 All you have to do to save $30 is to use code LUCKYSV at checkout! The code will only be valid until Friday, March 20th.